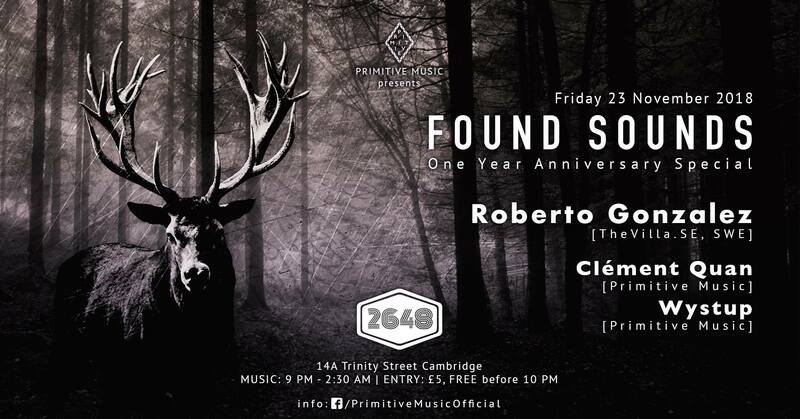 Primitive Music presents Found Sounds One Year Anniversary Special with guest Roberto Gonzalez. It is hard to believe that it was only one year ago Primitive Music had their first ever Found Sounds in the vaults of 2648 Cambridge. What started as an idea to bring underground house and techno to Cambridge has come a long way with one year of spreading love on the dance-floor. Now Primitive Music is an integral part of Cambridge’s ever growing underground music scene. To celebrate our birthday, none other than our very first headliner, Roberto Gonzalez, returns to Cambridge playing along side our residents Wystup and Clément Quan. Roberto Gonzalez has been a leading name in the underground scene in Gothenburg, Sweden for the last 15 years. He also hosts regular DJ mix sessions “The Villa” with guest artists such as Samuel L Session, Heidi Nesset, Hertz or Magnus Åsberg. Join us to celebrate our special night as our DJs raise the roof at 2648 Cambridge.